Confession: No one recommended Sweetie to me. I just wanted an excuse to watch this movie and write a bit about its director, Jane Campion. 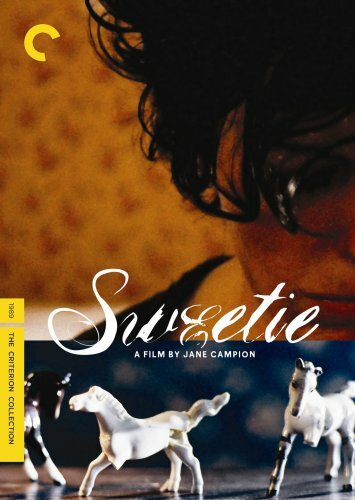 Sweetie is Jane Campion’s first debut film. It is the story of sisters Kay and Dawn, nicknamed Sweetie, who couldn’t be more different. Kay is emotionally distant, sexually stunted, and slightly neurotic. Sweetie is childlike, manic, and mentally ill. Their strained relationship is made worse when Sweetie shows up on Kay’s doorstep unannounced. Sweetie brings with her a deluge of problems that all leads back to the sisters’ relationship with their parents. Kay is fed up with Sweetie’s behavior; her parents just let it spiral out of control, until it is too late. For all this heavy material, Sweetie is a black comedy. The family arguments, small moments, Sweetie’s antics are often hysterical. At one point, Kay and Dawn have a wrestling match on the bedroom floor when Dawn shoves Kay’s horse figurines in her mouth. It as though they become little children again. But Campion and cinematographer Sally Bongers add experimental elements into the film that are striking, daring, and even weird. What I love about Campion’s films is how they approach female subjectivity and female relationships. They all tackle, to some degree, womanhood its messiest forms. And Campion is unafraid to craft complicated, multifaceted female characters. In Sweetie, Kay and Dawn are anything but one-dimensional. Campion leaves hints but no conclusions as to what may be the cause of their problems. What the complexity of their relationship brings about in Kay – her newfound spontaneity and sexual freedom – is a fascinating progression to watch. When I think about womanhood as it is presented in Campion’s films – and how she approaches it always varies – a scene from Bright Star is entrenched in my mind. When Fanny learns of John Keats’ death, she moves from the living room to a stairwell. She is framed by the doorway (the domestic space) as she collapses to the ground, calling for her mother. 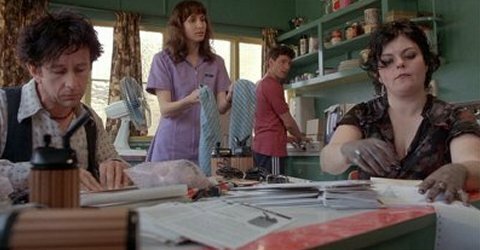 From this scene you see the dependence of a daughter on her mother, the beginning of a female experience (widowhood), and the function of the always present domestic space. The time period, the country, and the approach to these topics are, of course, different in Sweetie. But female relationships, female subjectivity, the domestic space – they’re all vital to this film. This post is part of my Birthday Blitz Marathon.